Rustle up this hearty and nourishing pasta dish for a real family feast. Add oil to pan on medium heat and cook chicken and chorizo until chicken is sealed. Move chicken and chorizo to plate while retaining oil in pan. Add onions to pan and fry on medium heat until softened. Add water, peppers, courgette and garlic to pan. Reduce heat slightly and cook for 5 minutes with lid on. Stir frequently ensuring you reach the bottom of the pan to prevent onions from sticking and burning. Don’t forget about your tagliatelle. Get some water boiling in a pan so you can cook as instructed on the packet to ensure everything is ready at the same time. Add V8 Juice, bay leaves, basil, pepper and salt and cook for a further 5 minutes with the lid on whilst stirring frequently. 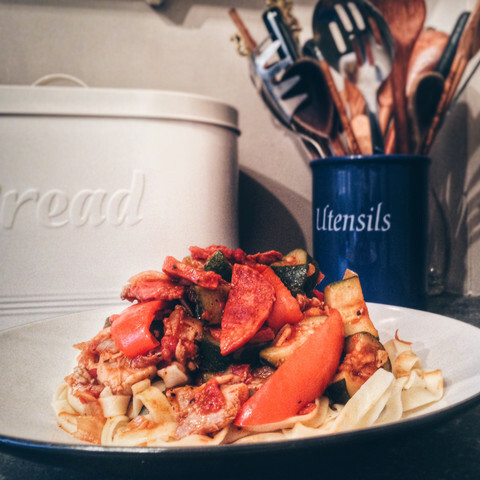 Reintroduce chicken and chorizo and cook for a further 2 minutes.